Scott and Becky go East » Blog Archive » We are off – Finally! We are off – Finally! After much packing, we finally left the house shortly after 3 pm. This meant that we left during the crowds of kids walking home from school. Several of the kids shouted “cool bikes”. I’m never quite sure how I should reply to that …“thanks man”. Our bikes are loaded with a random assortment of mismatched panniers. Unfortunately, we did not find the time to test out panniers and pick the ones we liked the most. This trip will help us do that and figure out what works and what doesn’t from a packing perspective. 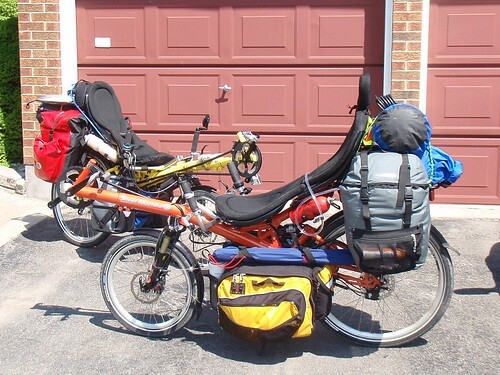 Right now, Scott is using a set of Ortlieb Bike Packer Plus (40l) as rear panniers, and Arkel RT-40 recumbent touring under seat panniers (40l). Becky is using Vaude World Tramp II Plus rear panniers (44l) and Ortlieb front roller plus under seat panniers (20l). In addition, we each have a dry bag strapped between our under seat racks (thanks to Rob Thompson for the idea) and another one or two attached to our rear rack. It certainly looks and feels like we’re carrying all our worldly posessions with us! When we get back to Ottawa, I’d like to simplify our packing by using a couple larger bags (perhaps the Arkel RT-60s on the back and RT-40s on the front if the RT-40s work well on this trip). We didn’t get very far before our first mishap occurred. I went down a hill and hit a bump. This should not really pose a problem, but this time it did. Right after the hill I could hear something rubbing and it caused me to lose my speed very quickly – which was quite unfortunate, as the other side of the downhill was an uphill! It turned out that my rear shock did not have enough pressure, such that it compressed to a point where the fender was able to get caught on the rear rack, causing it to bend and push onto the tire. Once we discovered the problem and cleared it, Scott added some air to my rear shock. Hopefully, the problem will not reoccur. Once we were finished with that little mishap, the weather took a turn for the worse. It has been beautiful all day, but we could see in the distance some thunder storms coming our way. The first one hit us when we were riding on a busy section of Richmond road – leaving Ottawa. Scott made a wise decision that we should detour into an Esso station, which had a cover. We were able to sit out the remainder of the storm under cover (about 10 minutes). We were well on the road when the second storm hit us. It wasn’t nearly as bad as the first. We got wet, but it wasn’t too bad. Then the sun came out and dried us out. It was a long day, mainly because we started out so late. We decided to stay in a hotel tonight – both the late start and the rain contributed to the decision … mostly it was because we arrived so late. We’re at the Tay Inn, which is a bit more expensive than we’d hoped ($69/night) but it is clean, dry and has space in the room for our bikes and all our gear. We had a lovely dinner at Wendy’s, since it was right next door, and the grocery store had already closed (for Madam, the Chicken Grill combo, for Monsieur, a large chili, baked potato and side Caesar salad), then came back to our room. There’s a team of guys staying at the hotel who are repainting the water tower, and they were sitting outside our room chatting and drinking beer, so we sat down and chatted with them for a bit – some interesting fellows! Murray is from Gunner’s Cove Newfoundland, and his parents own the only restaurant in town, so we’ll be sure to look them up when we get there. Robert is from near Sault St Marie, and had some interesting stories about a Medicine Man up there who cured his Lupus after the doctors told him he was incurable. He’s certainly cured now! 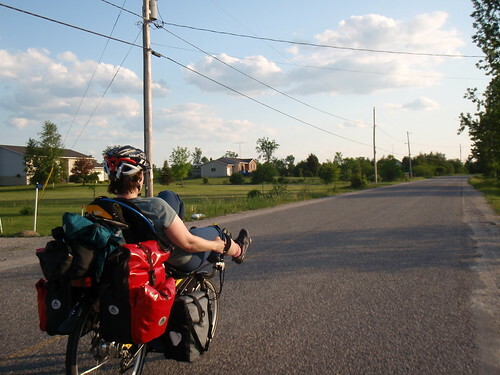 Tomorrow we are going to take a much more leisurely ride into Kingston (about 100 km). We’ll have all day to ride, so that should make it slightly more relaxed. This entry was posted on Monday, June 2nd, 2008 at 9:28 pm	and is filed under Journal. You can follow any responses to this entry through the RSS 2.0 feed. You can leave a response, or trackback from your own site.